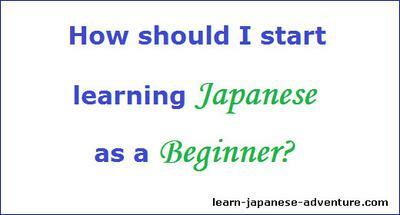 How should I start learning Japanese as a beginner of the language? How should I Start Learning Japanese as a Beginner? If possible, will you answer the rest of my questions? Hi Kyisha, please see my replies below your questions. 1. How should I start learning Japanese as a beginner of the language? If you are just starting to learn Japanese as a beginner, I would suggest you to find a language school near your area that offers basic Japanese lesson class. This is because it's important to have a good foundation when your are learning a new language, which I think a classroom-style environment can provide. A good and solid foundation will pave the way and make the learning smooth if you advance to the intermediate or advance levels. But be sure to look for a reputable language school with good Japanese native teachers. However, I understand you (and many people) may not be able to commit long term to attend regular classes due to your works, time schedules, money issues, or other personal reasons. In that case, I would recommend you to try out some Japanese learning software like Rocket Japanese where you can learn to speak Japanese at your own pace and time. Because this is an online course, you can plan your schedule to study anytime, anywhere, so long you have an internet connection. One important benefit that Rocket Japanese provides is the Recording feature that you can use to match your voice to that of the Japanese native's voice in order to perfect your Japanese pronunciation. This is the biggest reason that I recommend you this online software. While your pronunciation can be corrected by a teacher in a classroom, it's impossible to know whether your pronunciation is correct if you were to study by yourself. With this recording feature, now you can simply practise speaking Japanese until your pronunciation is perfect, all at your own pace. This is the greatest benefit of using Rocket Japanese. 2. What methods of study should I use? As I have written above, either attend a basic lesson class at a good language school or study using an good language learning software. 3. What resources are best for beginners to use? As a beginner, I don't think you will need many resources in the beginning. If you're attending classes in a language school, the materials provided should be sufficient. However, if you like, get a Japanese English dictionary (book) which I have recommended in my site. If financial is not a problem to you, get a Japanese Electronic dictionary which I have also suggested some of them in my site. Although you can find many online dictionaries, it's still good to have one (book or gadget) by your side whenever you need it, and the explanations will be in greater details as compared to that of the online dictionaries. 4. How long does it take to self-reach oneself Japanese? It all depends on your goal to reach what level that you are targeting. I don't deny the possibility of attaining high level by self-learning. However, I personally still prefer to learn with systematic way (classroom-style) where you can get guidance from the native teachers (I am the kind of person who like to ask many questions after lessons). Besides, you need very good discipline to self-learn a language. I won't doubt your discipline but most people tend to slack off after some time. For myself, I have studied in a school for five years (part-time) before starting to learn on my own. I have managed to pass every levels of JLPT (old systems, from JLPT 4 to JLPT 1) in the first four years. Besides, I have also attended JLPT preparation classes for JLPT2 and JLPT1 in the third and forth year. Well, my point is, you can study on you own, but you will need discipline and longer hours because there is no help from teachers when you need clarifications. 5. Is self-teaching possible in order to become fluent? 6. Is it possible to get a major for Japanese? I think it all depends on your goal. If you really like Japanese very much, sure you can major in it. But I think it will limit your future jobs to only jobs related to the language itself (like teachers or translators). Why not major in some other areas and study Japanese in a language school. It will widen your future job availabilities to more jobs that required you to know the language as an additional skill. For example, you can major in Engineering and find an Engineer job that required you to used Japanese to deal with the Japanese clients. In this case, if the Japanese market is bad, you can still find an Engineer job which don't required you to know the language. I am suggesting you not to limit your future jobs by majoring in Japanese only. But if you love the language so much that you have no other interest, then by all means go for it. Or maybe you can do a double major so that you don't limit yourself to only Japanese. 7. How often should I study? I don't have a fixed schedule myself. When I was studying in the first four years, I spent most of my free time learning Japanese. I don't feel it's a sacrifice because learning Japanese is my passion. I would say I spent at least three hours a day learning during that time. For now, I would spend probably an hour to get in touch with Japanese like watching Japanese online news and Japanese dramas, write emails to penpals, etc. It really depends on you. If you study longer hours and do it consistently, you will see result faster. 8. Should I take the time to learn Kanji? You might not need to learn kanji while you are studying the basic lessons where only hiragana and katakana will be used. However, if you want to go further, kanji is definitely a must. If you were to go to Japan, you probably cannot survive without kanji. Newspapers, documents, road signs, and almost everything are written in combinations of kanji, hiragana and katakana. I know many westerners are afraid of learning kanji because it's so different from the English alphabet and there're so many of them. But hey, there bound to have some difficult parts in any language. Fortunately, you are only required to know around 2000 of them to attain the same standard of high school students (in Japan). 9. Should taking the JLPT be a future goal? It's not a must for everyone learning Japanese. Some people learn Japanese out of interest. But I would recommend you to take JLPT if you intend to work in Japan or companies that need to deal with Japanese clients. Most companies will state the JLPT levels required for the jobs if you are not a Japanese native. Besides, taking JLPT let you know which level you have achieved and probably will push you further in your learning. 10. Do I have to live in Japan for immersion? If money is not a problem to you, it's always good to live in Japan for a certain period where you'll be surrounded by people in a all-Japanese-speaking environment. That'll be a great boost to your Japanese learning because you'll naturally be forced to speak, listen, and even think in Japanese in such environment. I didn't have the opportunity to go there to study, but how I wish I have the chance to do it. 11. What kinds of jobs are there for people who are fluent in Japanese? I think there will be many kinds of jobs available if you are bilingual in English and Japanese. Any companies that required to deal with the Japanese market will somehow need people who are fluent in Japanese. I am not sure about the job market in the America, but you should be able to find out more in your local newspapers or job agencies in your country. P/S: If you need further clarifications, use the comment feature at the bottom of the page.